Hi all, I’m completely new to the karting life. Long story short I’ve been reading through a few forums for probably about a year or so on bits to do with karting etc and I finally took the plunge. Great forum by the way. However since I’m completely new I’m stuck with a small (hopefully) problem, the Carb has been cleaned, new tank fitted and new fuel lines all round, when priming the fuel to the carb the instant I stop priming air bubbles quite rapidly back out of the fuel inlet on the carb and fill the fuel line back to the pump. Doesn’t seem to do it when running however on shut off instantly fills the line with air is this normal? When starting with just a little bit of air in the system the air doesn’t seem to move along the line hence my thinking fuel pump(I had to double check the fuel pump markings at this point make sure I’d not put it on wrong) I’ve just rebuilt the fuel pump as it was suggested on another post so will try that later on. Just didn’t know if I’m missing anything simple. Any advice or input greatly appreciated. I do have a couple of other bits to sort being a shorty 5ft-3 with the seat pedals and steering column but if I get stuck Il post in the relevant section. Can you post pictures and how are you priming the carb? High Tony thanks for the reply, priming wise I was told to blow into the small tank to pressurise the system fuel flows through into the carb no problem. I’ve just installed the rebuilt pump and so far seems fine unless upon starting it stalls and the choke is open. 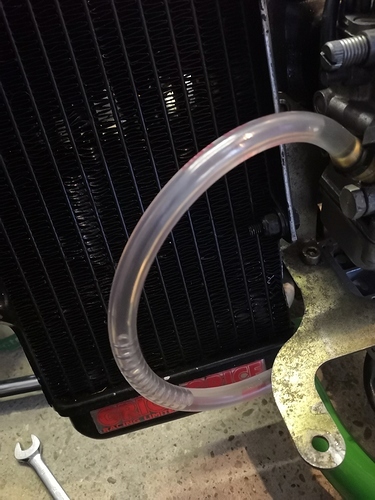 Next time, try pulling the fuel line off of the carb until fuel is running out the line, the reconnect it to the carb. Your idle issue is probably more reliant on float heights and jetting than the idle screw. It never did anything for us either. Remember that you are tuning the carb for best race setup. Never won a race while idling. Sometimes a little air in the line will appear, but going back all the way to the tank makes me think either the inlet needle isn’t sealing in the carb. Either because it simply has a bad seal, the floats are stuck or the height needs to be corrected. Cheers Tony Il keep that in mind, i think I sussed it with the pump rebuild seems to be ok, however Il check the carb jets and float height. Thank you James , it hasn’t let air back into the fuel line since I rebuilt the pump however if It stalls and the choke is open air fills that line from the carb back to the pump within a few seconds. Should it start with just the choke and no throttle? I have just realised everytime I’ve started it up I’ve used a bit of throttle, force of habit I think. On the carb front Il take it back off and have a look at the float level - what is the correct height for them? And give it a once over again with the carb cleaner. Ive also wrote down the main jet size -165 not sure what the idle was 55 rings a bell. Does that sound about right to you guys. Sorry about all the questions, pretty new to the 2 strokes hardly touched them, give me a old landy or hgv no problem. Hi Marin thanks for your input, I was just reading through a few threads seems a fair few don’t as you say which I didn’t realise. Il still strip it and make sure everything is cleaned properly and set the floats if needs be. Im not too fussed on the idle side but would be nice to know the carbs spot on. il just control the idle with the throttle as I am at the moment no biggy. Looks like the float height is meant to be 4mm, an app was recommended so downloaded it, has the jet settings too, don’t know how accurate it is seemed to be well rated. The best app on android. It has been extremely acurate, even moreso than the official rotax app. On prevo engines you can run whatever float height you want and just change it in the app to compensate for it. But you are better sticking with the 4mm in my opinion. Then you can compare with others.as well on the day. So jetting on a prevo is pretty simple, keep leaning until it pops at full tilt, then go 1 jet richer. Adjust needle for response off corner. Generally when you are running on the lean/pop edge you run the needle fairly high to give fuel down low. Ah that’s good to know, appreciate your advice, busy decorating today so won’t get a chance to do anything until next weekend now but Il set the carb up and then see how we go. On another note finally got my seat mounted still going to need pedal extenders and a heel riser only problem being a midget. he co manages the local track, he’s smaller than me so will see how his is set up for that, his kart I’m sure is a cadet kart🤣 it’s an old school one quite a small frame with a 25mm axle and struggles for bits on the water cooled TM engine. Anyway il keep you posted how I get on. Usually take photos as I strip stuff down for reference so il post them if I get stuck with the carb/running setup. Small update, i stripped the carb down I have cleaned everything with the old carb cleaner still a bit of grim came out even though was pretty clean anyway. The main jet turns out to be a 160 with apps recommendations (the GPS weather feature is pretty accurate Il give it that) I’ve ordered a full set of jets, will pop the 165 jet in and set it up again. New plugs have been ordered and I’ve given the filter a wash in petrol as was quite filthy so don’t know if that wasnt helping anyway il be having a tinkering session later on in the week Il keep you posted. I’ve tried everything on earth to get my pre-evo engine to idle and it won’t, so don’t let that alarm you. I’ve gone to the point of reaching out to dellorto themselves and they said they believe the fuel pump is simply too strong at idle (supplying too much fuel) and thats why they don’t idle. If you are not limited by rules you can lean the idle jet very slightly and see if it helps but becareful…too lean and you risk the engine running too lean on overrun and seizing the piston. Compressed air and brake cleaner are both a must when cleaning the carb. You need to get an air nozzle with an extended fine tip so you can blow through all the small ports (and there are many). Set the float height to 3mm measure from float arm to base of carb (no gasket) by bending the upper middle tab that sits on the check valve. that check valve is also something good to replace if you have never done so. If you have a 12.5 venturi carb you should be using the 5.2g floats and 30/30 idle jet and idle emulsion tube. If you have the 8.5 venturi carb you should be using the 3.6g floats and 60/60 idle jet and idle emulsion tube. Wind the throttle stop screw all the way in and back out half a turn if it does nothing as you’ve already said. To set the air screw, get the engine fully warm and up to operating temp, then get a buddy to help you out. One of you operate the throttle with your hand and very very slightly give the least amount of throttle you can to keep the engine ticking over. Once you find that point hold it there and ensure you do not move your hand. The other guy can now unwind the air screw quarter turn at a time from half in and you should hear the engine start accelerating even though the other guys hand is constant on the throttle. Keep winding the air screw out quarter turn at a time until the engine stops climbing rpm, this is your set point. Usually the point is 1.5-2.5 turns from fully in depending on your atmospheric conditions…do not go more than 3 turns out. Main jet as Marin already said, keep going one leaner until it pops with your foot down all the way, then go back up one maybe two until it revs cleanly to 13000+ rpm. The needle clip on a pre-evo is almost always either on clip 1 or 2…you need to feel the response of the engine when you first press the gas off a corner…its the same as the main jet…it feels better the leaner u go but too lean and you’d reach a point you go full throttle out of a corner and the engine gives no response…just hesitates as if you never pressed the throttle and then suddenly springs to life a second or two later…go back one clip richer on the needle. If you need any futher help with the engine feel free to post and I’ll do my best to help you out. Brilliant info Christopher, appreciate that, i have an 8.5 Venturi however the floats are 5.2 g with the 30/30 idle jet will the float wieght be a problem? Il order a correct set of floats either way if that’s whats supposed to match that size Venturi. Small update - Ordered a set of 3.5g floats, new 60 idle jet and 60 emulsion tube, Looking forward to getting it all setup and running. Daniel, the more important thing is that the floats and idles match. It would have been fine with the 8.5 on 5.2/30/30 but since you’ve already purchase it no harm in setting it up the way it would have left rotax. When you strip the carb, get a 9mm socket and get the outter edge reduced by a machine shop (can’t recall how much), but this is so that you can remove the seat for the needle valve (check valve) we were talking about earlier. Be sure to remove all the jets , the throttle and air screws and the fuel filter. Spray through every single passage you can find with brake cleaner and then with compressed air. Don’t forget the small holes on the air intake side of the carb. Also look down through the venturi and you will see two very fine holes, one a little bigger than one…this is the progression and idle ports and is very frequently overlooked. Get brake cleaner in through them followed by the compressed air (see why you need the extended reach fine tip air nozzle). Once you do the above thoroughly then set the float height you should be good to go with the carb. Where abouts in the world are you located? Good to know it would be fine with the current jets, I’d rather have it setup as it would have been. Spot on with your write up again I’ve got my brother coming round at the weekend with his small compressor and fine nozzles so got that covered. I’m Based in the UK by the way. No problem, glad i can help. I’ve accumulated a wealth of knowledge on these rotax pre-evo engines since we still race them here at our local club in Trinidad. I’m guessing your ambient temps now in the UK is around 15-20 deg C? I’d start with the main jet at 165 and needle clip on P3 which is the middle clip and then lean both as per the recommendation above. The power valve is another area that needs special attention to work as it should. What type of oil and at what ratio are you running it? The temperature is all over the place the last few weeks ranging from about 0 -16, we’re currently about 6°C today. Oil ratio is 40/1 25ml per 1l, I think it’s the Millers kr2 off the top of my head.